Episode 007 POLITICS - Jason Chatfield: "In America, I'll wrap my values in cheese" – Let's Talk About Sets! Episode 007 POLITICS - Jason Chatfield: "In America, I'll wrap my values in cheese"
Jason Chatfield is a standup comedian, voice-over actor, cartoonist, and illustrator based out of New York City. The scope of his talents is irritatingly impressive. He made his name in his native Australia as a political comedian, but since emigrating to the USA, he’s “closeted” his politics temporarily for the good of his career. Since he’s still a very political person, this episode is dedicated to political comedy, a theme the podcast is sure to revisit many times. This episode was incredibly fun to record — we could have talked for hours. Additionally, after much prodding, Jeff agreed to play a bit that he’s often afraid to do because he’s so often a big weenie. Back in his native Australia, Jason is known for being the cartoonist of the country’s most syndicated comic strip “Ginger Meggs,” which appears daily in 34 countries. 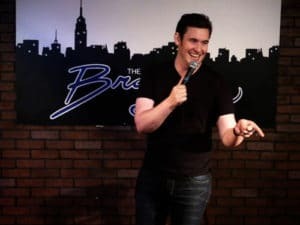 As a standup comedian you can catch him chopping it up in Manhattan, often at The Stand, Dangerfield’s, The Village Lantern, Broadway Comedy Club, and Greenwich Comedy Club. He is the Vice President of National Cartoonists’ Society, and he’s also has very recently been featured in the Mecca of American cartoon publications, “The New Yorker”. Indeed, there is a recent photo on his Facebook page of Jason hanging out in Portland with Simpson’s creator, Matt Groening! 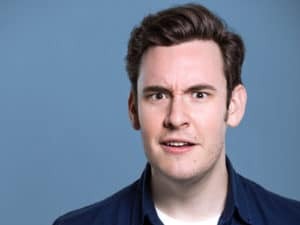 You might have seen Jason on Funny Or Die, as a New York correspondent for ABC News Breakfast, on ABC Radio, Nova 100, The Project, or on his podcast, the Stand up comic strip! As a world-famous cartoonist and a hysterically funny standup comedian, Jason Chatfield TRULY IS the COMIC OF COMICS!! Most importantly, he created the artwork for this podcast! Special thanks to Jim Jefferies, a MASSIVE thanks to Jason Chatfield, and (as always) a raucous dollop of gratitude to Salt ‘N Peppa for the industriously fair use of a heavily modified portion of their song.